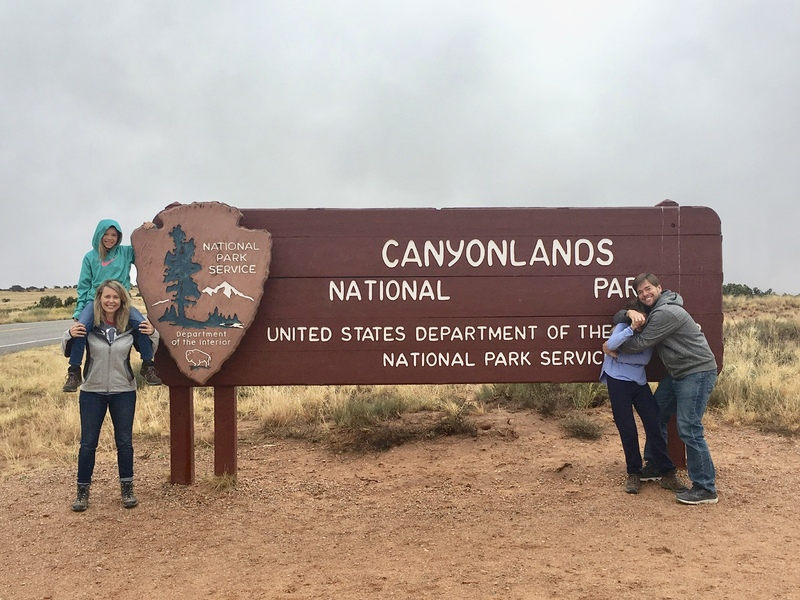 The 4th of the Mighty 5 National Parks we visited was Canyonlands National Park. We actually moved the RV to Moab and drove to Canyonlands from here. It was about a 45 minute drive. Canyonlands National Park was created in 1964 by President Johnson. It has countless canyons, mesas, and buttes. The park is divided into four districts: the Island in the Sky, the Needles, the Maze, and the combined rivers—the Green and Colorado—which carved two large canyons into the Colorado Plateau. We only visited the Island in the Sky on our one day trip visit. According to the park website the Needles is for a backcountry experience and the Maze is a remote district requiring considerably more time and self-reliance to visit. We stopped at the visitors center first and you can tell my the picture how excited the girls are to get their junior ranger badges. The Island in the Sky mesa rests on sheer sandstone cliffs over 1,000 feet above the surrounding terrain. All the pull outs, viewpoints and hikes give different perspectives. The first trail we did was to Aztec Butte where we were able to see ancestral Puebloan granaries (pantry). As we approached the butte we could literally see a storm rolling in. We made it to the granary right before the rain reached us. We sat under the over hang in silence for 10 minutes while we watched the storm. When it let up we made our way back to the parking lot. The 2 mile trail has a slight elevation change of 225 feet and takes about an hour and a half. Grand View Point lies at the southernmost point of the Island in the Sky scenic drive. From here, you can see the White Rim, features in The Maze and The Needles, and distant mountains. A short, paved sidewalk leads to a spectacular viewpoint. From there you can hike along the rim to a second viewpoint. Mesa Arch is a natural arch that is on a cliff edge. You can get views of the White Rim Road, canyons, and the distant La Sal Mountains from here. This trail is and easy .5 miles RT. Here is a picture of the 4×4 trail that leads to the bottom of the canyon. Check out the rainbow. I was bummed that it was raining on and off all day and we weren’t going to be able to catch a sunset UNTIL these magnificent rainbows started appearing at every corner on our drive out of the park. Some were double rainbows and some were complete semi circles. I had wished I brought my good camera and zoom lens because I was pulling over to take a pictures, with just my phone, any chance I could get until my family got annoyed with me. For an hour and half we marveled at these rainbows that will be forever etched into my memory.